Butler kicked 77 field goals in college, which was a SEC career record, and his 60-yard game-winning field goal against Clemson was one of 11 over fifty yards. He was chosen by the Bears in the fourth round of the 1985 NFL draft and beat out veteran Bob Thomas. Bears went 15-1 to finish first in the NFC Central with the conference’s best record while leading the NFC in scoring (456 points). Won NFC Divisional playoff over New York Giants (21-0), NFC Championship over Los Angeles Rams (24-0), and Super Bowl over New England Patriots (46-10). After setting a rookie scoring record in 1985, Butler followed up in ‘86 by leading the league in field goal attempts (41) but he connected on only 28 of them as his percentage dropped due to slumps. 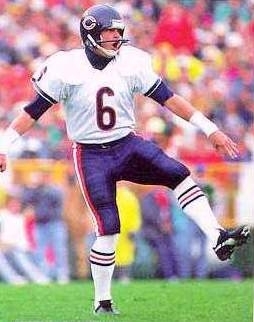 However, he performed well in clutch situations and ended up staying with the Bears for 11 seasons, through 1995. He made good on 243 of 332 field goal tries (73.2 %) and added 387 extra points out of 397 attempts, scoring a total of 1116 points, all of which set club records. Released by the Bears, Butler spent his last two seasons with the Arizona Cardinals, adding another 22 field goals and 26 extra points to give him career totals of 265 field goals, 413 PATs, and 1208 points. In 12 postseason games, he kicked another 17 field goals and 23 extra points, all with the Bears. Butler was inducted into the College Football Hall of Fame. His son Drew has been a punter in the NFL.